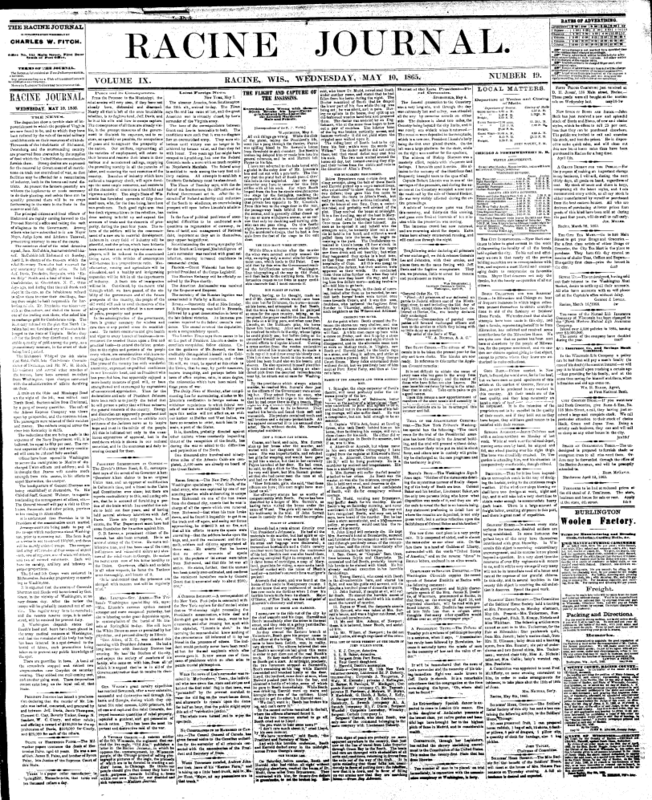 This newspaper article from May 10, 1865, contains reactions from Racine, Wisconsin's point of view. This article contains excerpts about the escape route of John Wilkes Booth, and the plans he had, as well as the actions that he took on his journey. It also contains, a account from both Mrs. Lincoln, and Vice President Andrew Johnson. In these two excerpts both Johnson and Mrs. Lincoln explain there reactions. Johnson's reaction was placing a proclamation in action that gave a reward to those who captured the killers. Mrs. Lincoln reacted through shock as she fought through the mourning of her husbands death. Finally, there is an excerpt about the funeral ceremony that explains how long and widely attended Lincoln's procession was.